First released back in 1989, TypeIt4Me is one of the most enduring of Mac utilities. It’s been three years since we reviewed it (4.5 mice). Since then, it's gone up a couple of version numbers. While it's essentially the program Macworld praised back then, it has also acquired some significant—and nice—new features. In concept, TypeIt4Me is much like its competitors (TextExpander, Typinator, and others): You enter text clippings—bits of text you type frequently—then assign shortcut keys to them; thereafter, when you type one of those shortcuts, TypeIt4Me will insert the corresponding clipping, saving you the trouble of typing out the whole thing. For example, I use ad1 and ad2 to insert the first and second lines of my address; I use hrf to wrap a URL that I've copied in HTML href code and put the cursor in position for me to add the text for the link. TypeIt4Me clippings can contain plain- or rich-text as well as images. While it's simple to create basic clippings, adding special items like dates or specific modifier keys, requires a bit of menu-navigation. When you create a clipping, by default it'll be available in all of your applications; if you want to make it available in just one, you can click on the appropriate icon in the App column. You can also create files that contain multiple clippings; you could have a different file for every application in which you might want to use clippings. The biggest change from version 3.1 to version 5.0 is that TypeIt4me is now a real application. Previously, it was a 32-bit pref pane; that meant, if you wanted to open it in Snow Leopard, you had to quit System Preferences and relaunch it in 32-bit mode. That step is now gone. In use, this new version for the most part feels much snappier than the last. Since we last reviewed it, TypeIt4Me has also picked up a couple of nice new features. AutoCorrect is similar to what's built into Microsoft Word and some other apps, but TypeIt4Me makes it available in any program. Unfortunately, as is common with such tools, it won’t catch every mistake, and its corrections are sometimes wrong. TypeIt4Me 5.0 also has AutoCue, which enables you to create substitutions that pause to allow you to type in variable text. For example, if you had to send out a daily activity report reading, "Today I finished 10 customer projects," you could create a clipping with all the text and use Autocue to insert the daily-changing number. 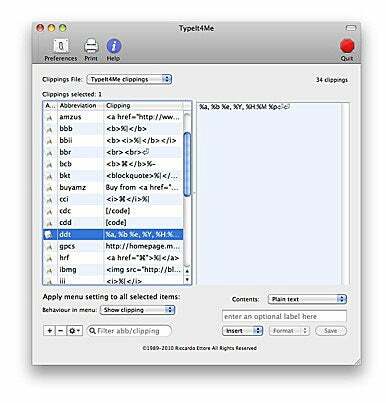 Unlike TextExpander, TypeIt4Me doesn't have any built-in tools to sync clippings with other Macs via MobileMe. While you can get similar functionality by storing your clippings file in a Dropbox folder, it would be nice if syncing were integrated into the application. Still, TypeIt4Me has been around so long for a reason: It's a really useful utility that does what it says. If you want to give your fingers a rest, TypeIt4Me will help. A really useful utility that does what it says: If you want to give your fingers a rest, TypeIt4Me will help.